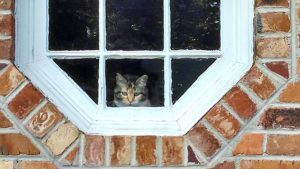 Eppie is the beautiful little girl looking through the window of our Kudzu Cottage. The window is about 4 1/2 feet off the ground, there is no furniture under it. Eppie is a very small girl. So there is the mystery. I was on my way home one day and saw her in the window. I sneaked back around to capture this shot. To this day, I’ve never seen her get into the window or get out of the window…from the inside.